Join 4 Tri-State Area prep school kids as they Greyhound to places unknown (The South). it’s the urban version of cow tipping. Not only does this reaffirm my distrust of progress bars, but it’s increasing every second. As we speak it’s over 3 million percent, and 32 days. If I am to believe this, then the process won’t be complete for over a month, but it’s already complete many times over?! 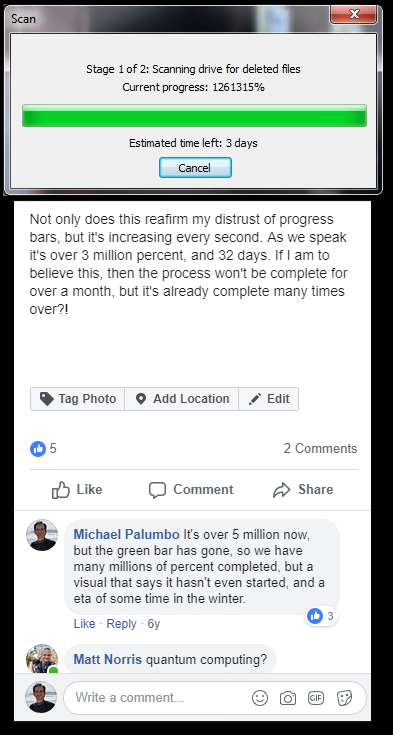 It’s over 5 million now, but the green bar has gone, so we have many millions of percent completed, but a visual that says it hasn’t even started, and a eta of some time in the winter. A History of Hacks and Pranks at MIT By Institute Historian T. F. Peterson and learned more of the MIT Hacking community and its history. Before the term hacking became associated with computers, MIT undergraduates used it to describe any activity that took their minds off studying, suggested an unusual solution to a technical problem, or generally fostered nondestructive mischief. Hacks can be technical, physical, virtual, or verbal. Often the underlying motivation is to conquer the inaccessible and make possible the improbable. Ultimately it’s about solving the problem, learning from it, and using the learned skills for good.